Fancy rats have been bringing joy, entertainment and class to our homes for decades although the idea of keeping them as pets is about one century old. They are clean, intelligent, enjoy human company and make wonderful pets a long as you provide them with the best fancy rat cages.. If you provide fancy rats with a quality, spacious cage, handle them often in order to socialize them from early age correctly from birth, your quirky pets will entertain themselves and gladly include you in their friendship as long as you give them care and attention. The varieties of fancy rats include Dumbo Rats which are cute, cuddly and calm, Rex Rats with twirly and tweaky hair, Blue Rats in striking and rich blue color, Russian Blue Rats with their classy metallic shimmer, Albino Rats with their intriguing red eyes, exotic Siamese Rats, Hairless Rats which are smooth and unusual and new breeds appearing continually. These inquisitives critters are great companions and social creatures and although they like the attention from people, their lives are not complete without a companion of their own kind. When you’re out at work or school or taking a nap or shopping, fancy rats will be happily playing together. Male rats are called bucks, females are does and babies are known as kittens. On average, rats’ lifespan is about two and a half years. Eager, spry and adventurous, female rats are a great choice as they learn quickly and have inquisitive and mischievous personalities. Females are more petite than males and also have less smell. 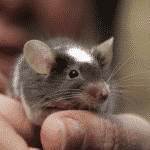 Male rats like to mark out their territory but that can be reduced by neutering. The boys often grow into blissfully calm couch potatoes while the ladies are more into exploring and fooling around their home. With more than one rat, your pets will entertain themselves and still gladly include you, once you are back. The fancy rat cage should be as big as you can afford it and since you are going to buy a suitable cage only once, the price should not be the issue, especially if you will have more pets. Fancy rats need a lot of space so the minimum suggested cage room is 2 cubic feet per rat. The minimum size for 2 rats is 28” x 15” x 20”, or similar. However the bigger the better is always recommended to provide ample space not just for playing, exercising and climbing but also for furnishing the cage with toys, accessories, best rat food and water bowls and bottles and so on. The bars should be no more than 0.6” apart or the little ones may get their heads stuck or escape. It is generally always a better investment to buy a more expensive and larger cage with small bar spacing that will securely hold baby rats and provide ample space for your pets when they grow up or in case you decide to add more quirky little rascals later on. The prices of fancy rat cages range from $200 - $800 depending on the size, construction, number of levels and the features of different models. You will save money in the long run if you buy a single cage bigger in size rather than several cheaper cages. In addition, one larger cage made of better materials works out to be ultimately cheaper than two smaller cages made of less expensive and low quality materials which will eventually wear out, break or become unusable. Depending on the number of fancy rats you will be keeping you can choose between single level or multi level cages as well as between stationary units or units with wheels which you can easily move around. Fashionable Rat Cage measures 31" L x 20.5" D x 40" H and has bar spacing of 3/8 inch. One of the most amazing spacious fancy rat cages, this unit comes with pet friendly powder coated steel bars and will blend in with almost any home décor. It will allow you to watch and admire your pet as they run and play in their roomy and cozy home. It also features two easy clean platforms and ladders so your pets can move around your cage with ease. It features wheels for easy positioning. This beautifully constructed large cage features pull-out bottom grille and drawer to help make cleaning quick and easy. The small wire spacing and solid metal ramps and platforms make this an ideal cage for fancy rats as they will not only be safe and secure in this unit but will also have plenty of space to play, explore, exercise and entertain themselves as well as their pet owner. This large fancy rat cage offers the convenient option of choosing the right spot in the home as owners can wheel it around easily. At the same time, the unit provides plenty of safe and comfortable space for pets to run, jump, climb and play. Large front door provides easy access to pets but also to add accessories such as an exercise wheel and you can also hand hammocks and ropes for even more fun times for your pets. The wind-bell lock, on the bottom of the cage, prevents pets from pushing out the tray if the cage is used without the grille. The bottom shelf is included for storing extra food, treats, toy and cleaning supplies. Freddy Cage measures 39.4 x 19.7 x 31.5 inches, comes in navy blue color. It has platforms, one ladder, one hammock, a drinking bottle, corner toilet, a play tube and a feeding bowl, which is the most versatile and complete set of fancy rats’ cage accessories included in the price. Don’t let you the product picture confuse you: this is a huge cage! Even with all furniture in place, there will be plenty of space for your little snoops to explore their lovely home. From time to time, you can rearrange the accessories and provide a different setting which will motivate the rats for even more funny games and exploring. The floor is a solid tray, which is a must feature to avoid a rat trapping or injuring its feet. Wire-style cage allows plenty of air and your nosy and agile little companions will have excellent ventilation. Litter should be put on the floor to absorb ammonia from droppings. A disciplined litter training your rats will help to keep their cage clean and the use of dust-extracted bedding will prevent respiratory problems. Regular cage cleaning with a reputable brand of products containing antibacterial and antifungal ingredients will also help to prevent any health issues. Rats also need a nest box where they can sleep and enjoy a bit of peace and quiet so you can add as many as you need in bright, matching colors. Your fancy rats will enjoy a hammock hanging in their cage for both playing and rest. Large 4-Level Small Animal Cage includes slotted ladder, slide out tray, and a removable bottom pan. This unit is extremely durable and has plenty of space for your little fancy rats to explore and play, and while they do, you and your family will be entertained and as happy as your pets are. This cage features three platforms with connecting ladders. This encourages healthy activity, exercising but also makes rats’ life more interesting as they snoop between the levels. The slide-out tray makes cleaning a breeze and the large slide up door allows for easy and convenient access to your pet. The unit measures 32"x21"x62" with bar spacing of 5/8" which is more than solid spacing to provide secure environment for the little ones. Ideal for fancy rats but also for a variety of small animals, this cage has 4 wheels for easy movement so you can put it where ever you want in the home or change its position later on easily. The whole cage takes about half an hour to assemble by one person. A pair of helping hands would be great as the cage is quite heavy, being sturdy build. This model is really easy to clean which you should do thoroughly at least once a week using pet-safe disinfectant. Make sure you clean everything your rats touch. A cage with two or more rats should be cleaned more often. Midwest Critter Nation is a sturdy, high quality home for your fancy and can be a classy focal point for your living room as you enjoy watching the playful pets. The 1/2" horizontal wire spacing allows your rats to climb and play in a safe and secure home. The built-in dual-locking door latches provide a secure, easy one-handed operation. This unit is easy to move using locking casters to keep it in place so you can choose the best spot for this beautiful rat habitat. The stand raises the cage to a comfortable height and provides a convenient area for storing supplies of food and accessories. Less-Mess feature and easily removable height-adjustable shelves together with removable plastic tray is a great feature for convenient and easy cleaning. You will certainly appreciate how hassle free it is to care for your pets’ environment. The happy feet ramp covers protect your fancy rats’ feet by providing traction and no-slip surface. Exploring and playing between levels will be completely safe for the little ones. The shelves have three height adjustments which allow control over where you will fit cage accessories. You can add play toys, tubes and hammocks as well as branches for more for vertical climbing. Kaytee Defined Rat Habitat measures 25.25 x 12.25 x 28.25 inches and belongs to the medium size rat cages category. As regards the design and construction, this unit belongs to the next generation of small animal habitats. Defined Rat Habitat by Kaytee makes interacting with your pet safe and effortless. The multiple levels of play offer your pet rats a fun-filled playing, exploring and climbing experience. Fully opening top door allows for easy interaction with your pets while the spring loaded door locks provide a secure environment. You can always offer a change of scenery to inspire your rats’ sense of adventure. Simply rearrange their toys and hammocks and they'll explore this cage all over again. 1/2 inch wire spacing is the idea size for keeping your pet rats safe and secure and with rounded corners and an extra-deep base design this cage is super-easy to clean. This elegant rat habitat includes 3 Safety Ramps, 3 Comfort Shelves, and a food dish but you can accessorize the cage further to your preferences. 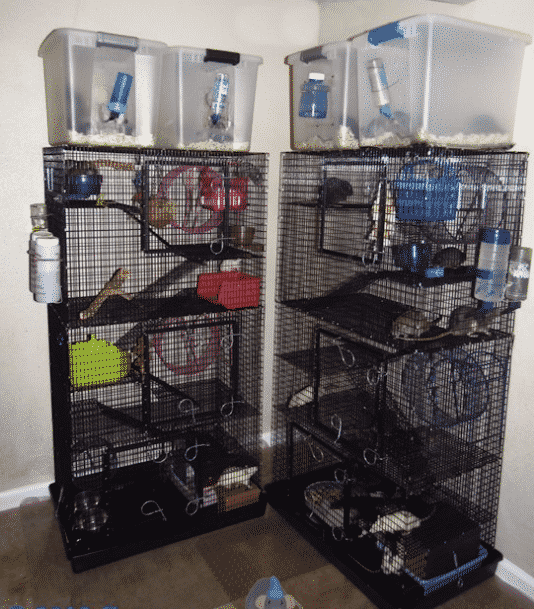 Modular Add-Up fancy rat cage is of solid size nice and the fact that it is modular makes it stand out from other cages for fancy rats and other small animals. The metal is sturdy build but the base is a bit wobbly. It can get a tad difficult to add the add-ons and the platforms inside the cage are tied together with a tiny zip ties which don’t make the platforms overly stable so we recommend that you add more safety clips. The modular feature is a really great way to adapt this habitat to your pet’s and your own preferences. However, overall stability for little rats should be adequate but don’t count on the platforms to hold something heavier, such as ferrets or chinchillas, without bending. The base on the two levels is made of wires, which is not the safest option for the rats’ feet so extra padding would be perfect. Also, beware of the dropping and urine missing the tray and possibly leaking from the bottom. In general, the idea and the appearance of this modular habitat are great but the build quality could be better to make this unit a perfect, versatile home for your pets. Posh Pets Gulfstream Huge Rat Cage features double storey design with large upper and lower opening doors. 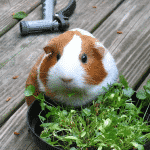 Apart from rats, it can be a spacious home for chinchillas, ferrets and other critters. This cage features a full middle floor, two balconies and three ramps with amazing amount of play space. The three ladders between the platforms are wide and solid but, again, padding is recommended. However fond of their home your rats seem to be, don’t forget that they require a fair amount of attention and exercise time outside of their cages. At least an hour a day is ideal for you to handle them and play with them in rat-proof part of your home, of course. The strong steel construction guarantees durability and the fitted castor wheels provide easy movement around the home. Inside, there is enough room for hammocks and tree branches for climbing as well as feeding bowl and water bottle.